With its incredible strength and beauty, it's no wonder that platinum is a popular choice for engagement jewelry. From gorgeous designer pieces to mixed-metal designs and other styles, there are many platinum rings to choose from. Learning about the options is an important first step in choosing the perfect engagement ring. 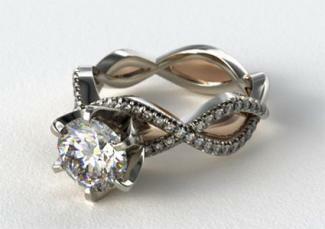 Several designers specialize in platinum wedding and engagement jewelry. If you want a ring with a designer name and unparalleled beauty, consider one of these noted companies. Offering extraordinarily delicate looking platinum and diamond rings, Tacori appeals to brides-to-be who love romance and elegance. Their spectacular pieces are made in California and typically feature a high-profile setting for a focal diamond and lots of smaller accent diamonds. Prices start at around $4,000 for platinum engagement styles. With styles ranging from simple to gorgeously complex, Verragio offers rings for every bride's taste. Many feature a unique two-layer band that features filigree along the outer layer while still leaving a comfortable, smooth layer against your finger. This design allows lots of light to reach the diamonds. Prices start at around $1,500. There's nothing like the iconic blue box to add even more excitement to your engagement ring purchase. Tiffany & Co. offers simple, elegant designs that appeal to the bride-to-be with traditional or even modern taste. These tasteful platinum rings include the famous Tiffany solitaire, as well as designs featuring diamond-studded ring shanks and halos of smaller diamonds. Prices start at about $10,000 for platinum rings. Engagement rings featuring platinum bands come in many designs, so it's easy to find one that fits your personal style. Whether you're looking for something old-fashioned and romantic or clean-lined and modern, your perfect ring is out there. If you're interested in something a little different, consider one of these unique styles. Platinum isn't limited to diamonds. In fact, it looks equally fantastic with a colored gem. The Emerald-Cut Carrie Ring (pictured) from Gemvara is available in more than 20 different gems for the eight-millimeter emerald-cut center stone. The platinum setting, embellished with dozens of tiny diamonds, is the perfect backdrop for this colorful choice. 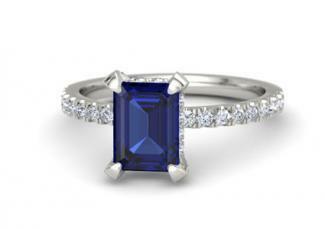 This ring starts at about $6,000 when set with a sapphire. Because of its cool tone, platinum pairs well with many other metals. Many jewelers use white or yellow gold for the prongs on platinum rings, since the greater malleability of gold can allow for a more secure setting. Sometimes the mixed metals become a focal point of the design, as in the offerings from James Allen. This jeweler offers dozens of mixed metal engagement rings, starting at around $1,000, and you can select platinum for one of the metals. 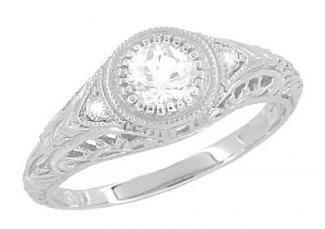 If you love the delicate, lacy beauty of antique-style rings, a platinum filigree ring could be a lovely option. Because of its strength, platinum is an excellent metal for this type of design. Antique Jewelry Mall has a huge selection of old-fashioned platinum engagement rings with gorgeous filigree and engraving. Rings set with diamonds start in the range of $2,500. If you're considering platinum for your engagement ring, it's important to understand some of this metal's benefits and potential drawbacks. That way, you can ensure you purchase a ring you'll love for the rest of your life. If you've spent some time browsing platinum rings, you've probably noticed that this is the most expensive metal you can choose for your engagement jewelry. According to Adiamor Diamonds and Fine Jewelry, platinum is 35 times rarer than gold. Because of its scarcity, the metal is far more costly than gold - usually about twice as expensive by weight. While platinum and white gold are similar in color, platinum has higher purity, weight, durability, and rarity than its white gold counterpart. Platinum engagement rings offer more resistance to scratches and are thought to be more luminescent due to the metal's purity. Like gold, platinum is hypoallergenic and resistant to tarnish or rusting. Platinum is very durable and scratch resistant, but you should remove your ring during heavy work or when using harsh chemicals. You can clean an engagement ring made out of platinum yourself with a gentle bristle brush and a mild solution of soap and warm water. If your ring begins to lose some of its shine over time, your jeweler can buff it to help it retain its natural luster. When you're not wearing it, you should store your platinum ring in a fabric-lined container away from other jewelry that may cause scratches. Is a Platinum Ring Right for You? Deciding whether to choose platinum for your engagement ring is mostly a matter of budget and personal preference. There's no denying that this is a gorgeous metal with unparalleled durability and strength. However, there are a few reasons it may not be right for you. While the idea of such a valuable and rare metal may be alluring, the expense dissuades many couples from choosing platinum engagement rings. Furthermore, many people cannot tell the difference between platinum and white gold or sterling silver rings, so the expense often goes unnoticed. Although platinum is an extremely strong metal, it can be damaged. Because this meal is more brittle than gold, damage can be severe. 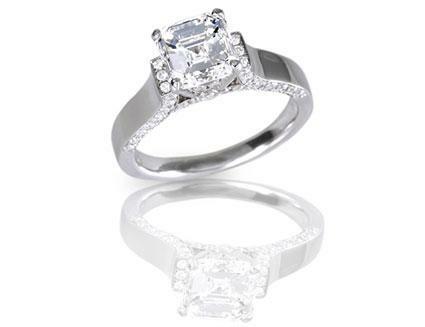 You may need to seek a specialized jeweler to perform quality repairs. Expect platinum ring work to cost more than repairing other types of jewelry. Because it isn't as malleable as gold and silver, resizing platinum jewelry can be a bit more challenging. You'll need to pay more for the work and research to find a jeweler who has the necessary tools and is comfortable with this type of job. If you do choose a platinum ring, it may be wise to consider additional insurance to protect your investment. This may result in a small charge from your insurance company. Platinum's rarity and durability makes it the perfect choice for an engagement ring that signifies the depth and uniqueness of your love. While it is expensive, many couples feel that the investment is one that is meant to last a lifetime and will undoubtedly be worthwhile in the long term.